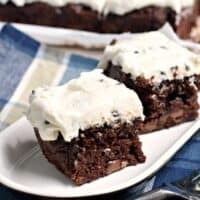 One taste of these Fudgy Chocolate Chip Zucchini Brownies with Chocolate Chip Frosting and you’ll agree they are the most wonderful brownie you’ll ever enjoy! I think my zucchini crop has FINALLY slowed down. Which means I only have about 3 more zucchini recipes to share this year, haha!! 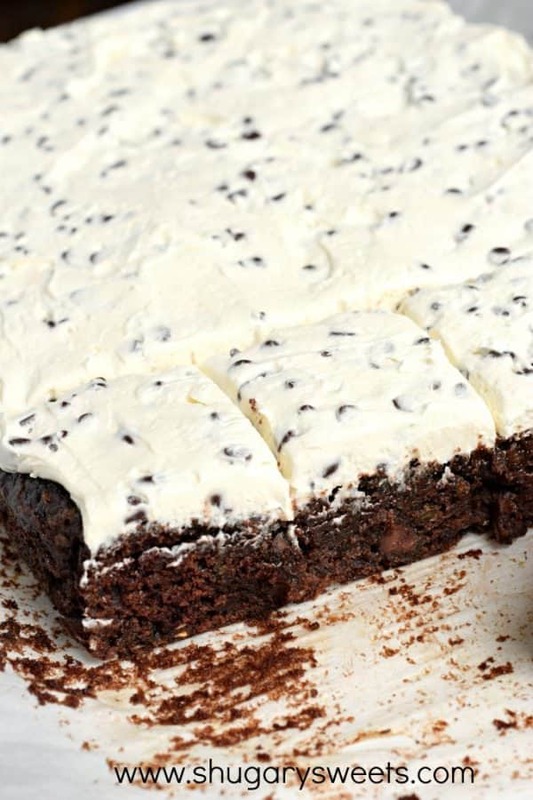 My kids went off to school this week, but before they did I made a batch of these Fudgy Chocolate Chip Zucchini Brownies with Chocolate Chip Frosting. They had NO IDEA I snuck some zucchini into this delicious treat. 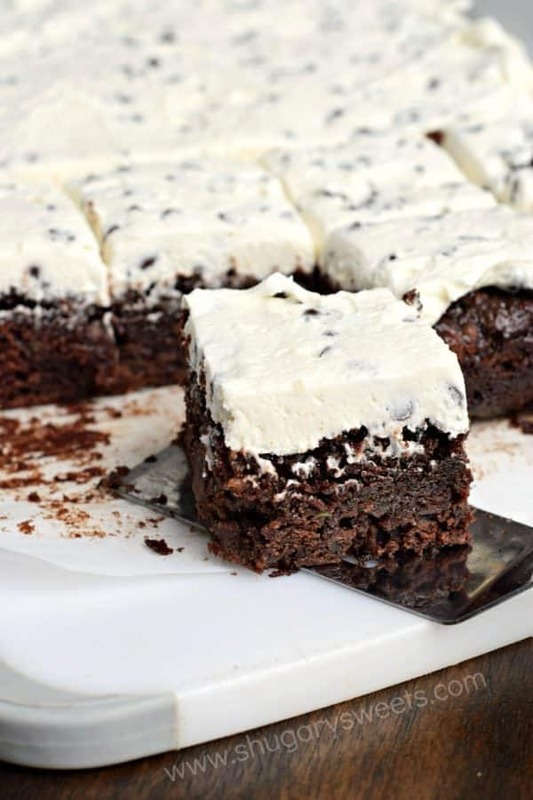 The brownies are so rich and gooey, but then topped with a frosting, they are irresistible. Mix up all the ingredients for the brownies in one large bowl (no electric mixer required). Let the mixture set in the bowl for about 5-10 minutes. This allows the moisture from the zucchini to distribute. Don’t fret if the batter seems dryer or thicker than a traditional brownie batter. TRUST ME. I use semi-sweet chocolate chips for the batter, and mini chocolate chips for the frosting. I like the smaller sized chips in the frosting, but go with what’s in your pantry. REFRIGERATE. I find these brownies taste best COLD. Plus it makes them easier to cut and serve. I bake them in the evening, and refrigerate them overnight. THEN, the next day I’ll put on the frosting. Or bake in the morning, refrigerate, then frost before dessert. I also STORE them in the refrigerator. It’s not necessary, but again, I LOVE these chilled! 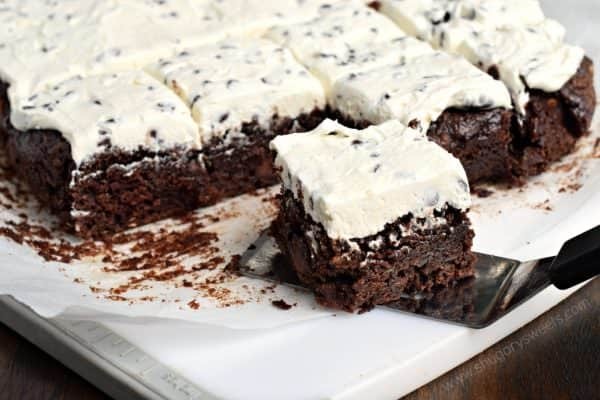 If you love a fudge frosting instead of this chocolate chip frosting, you can find one here on these Chocolate Zucchini Brownies recipe! 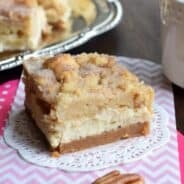 You can also visit my Cookies, Brownies and Bars Pinterest Board for more inspiration! ENJOY! Love brownies? I’ve got you covered…. 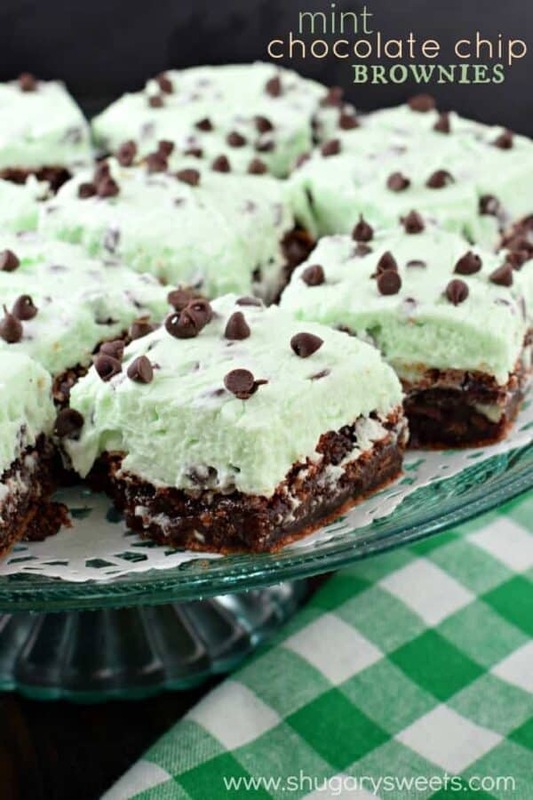 Mint Chocolate Chip Brownies: no zucchini in here..just lots of delicious mint flavor! 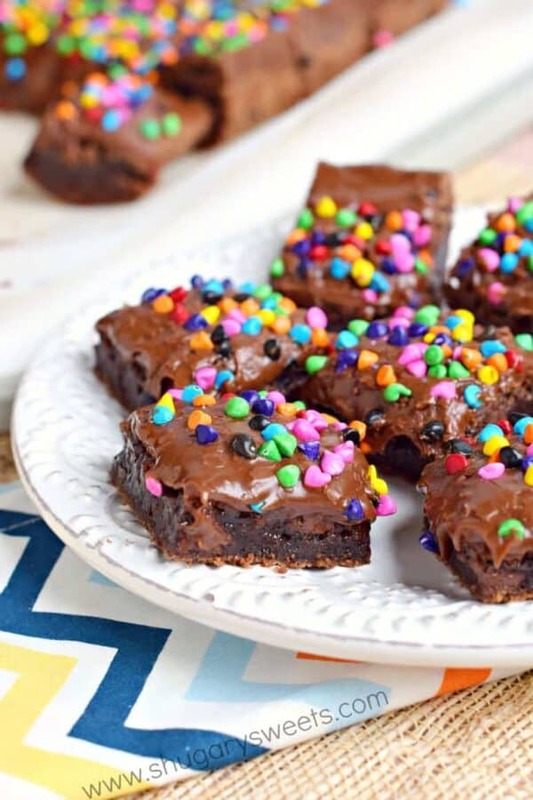 Rainbow Chip Brownies: sometimes called “cosmic” brownies…either way, AWESOME! 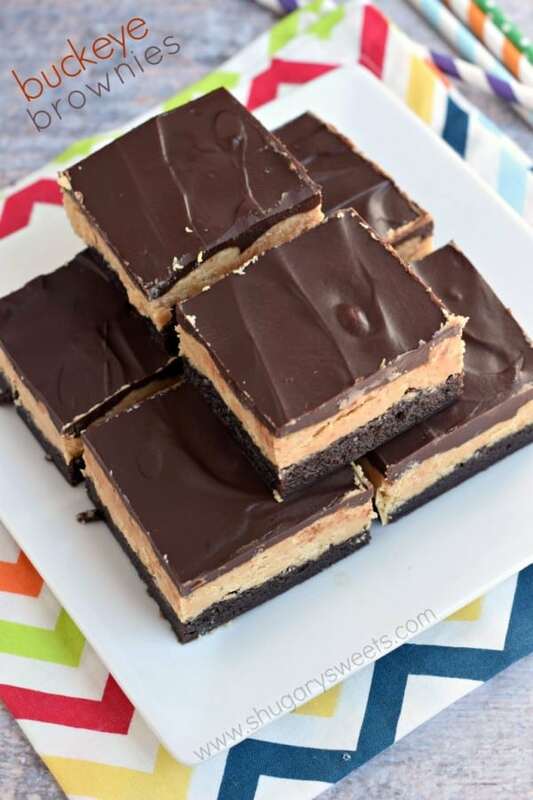 Buckeye Brownies: with a layer of peanut butter, these are over the top delicious! 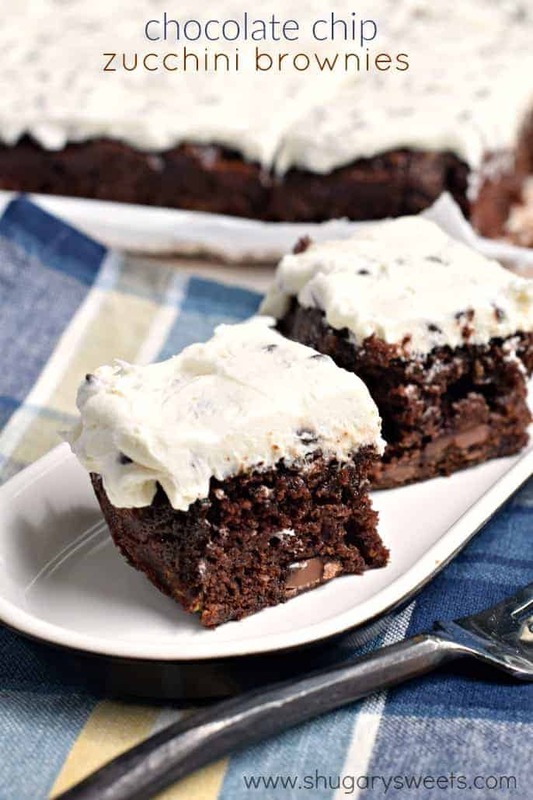 One taste of these Fudgy Chocolate Chip Zucchini Brownies with Chocolate Chip Frosting and you'll agree they are the most wonderful brownie you'll ever enjoy! Preheat oven to 350°F. Line a 13x9-inch baking dish with parchment paper. Set aside. For the brownies: in a large bowl combine all the ingredients together with a wooden spoon or rubber spatula. The mixture will be very dry. Allow to sit about 5-10 minutes to let the moisture from the zucchini incorporate into the batter. It's okay if it still remains VERY dry. Pour into prepared baking dish and bake for 25-30 minutes. Remove from oven and cool completely before adding frosting. For the frosting: beat butter and powdered sugar with vanilla and cream for about 3-5 minutes, until fluffy. Fold in chocolate chips and spread over cooled brownies. Refrigerate and enjoy cold! 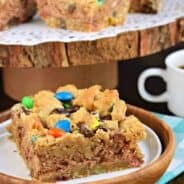 Today’s recipe for Chocolate Chip Zucchini Brownies was originally published on Shugary Sweets on August 22, 2016 and has been republished in July 2018. Honestly, the combo of a fudgy brownie and the moisture of the zucchini is such a powerhouse for me. I would not be able to stop eating these, but that’s okay since it’s a veggie with benefits. And that frosting…melting in my seat right now! I don’t know what it is about chocolate and zucchini…but I love it!!! That layer of frosting is calling my name right now!!! These were the best brownies. I used a simple ganache icing. Yum! yay, glad you loved them!! These are my kinda brownies! Batter was dry and almost crumbling but baked up super soft and delicious. Thank you! So good! Weird how that works, glad you trusted me and baked it!! Must try! Thanks for the recipe! I don’t, because I use fresh zucchini. If you’re using zucchini that’s been frozen, it tends to have more liquid, so you may want to squeeze some of the juice out! &Thanks for the link love! yum! i have so much zucchini and will be putting your recipes to good use!! These were delicious! 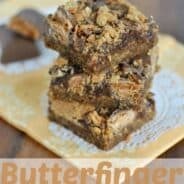 Better than box brownies I’ve been making for years! These are delicious. My husband said he could have this for a birthday cake. The pumpkin zucchini bread is great also ???? Love when I can sneak in some healthiness and still enjoy chocolate too! And that chocolate chip frosting, yum! !